Over the course of the last couple of years, we have seen the number of companies adopting usage and consumption-based business models continue to grow. As more firms incorporate digital products and services into their product portfolios, will usage- and consumption-based business models become their preferred models? We commissioned Forrester Consulting to conduct a study to get some answers to that question and more. 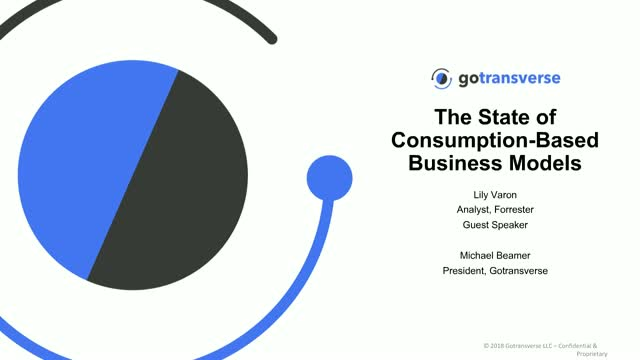 Join our guest, Forrester analyst, Lily Varon, and Gotransverse President, Michael Beamer, as they review the findings of the commissioned study conducted by Forrester, Capitalize on Your Digital Transformation with Usage-Based Models. Forrester surveyed 170 Director+ decision-makers responsible for billing platforms and heard from a wide-range of subject matter experts on the current state of usage and consumption-based pricing. They got deep in the weeds to uncover the motivations, benefits, and the challenges of implementing a usage-based business models. 1. How satisfied are organizations that the business model used is the right model for your business? 2. What are company's plans for adopting a consumption- or usage-based model? 3. What challenges are organizations facing/have faced in adopting a usage- or consumption-based billing models? 4. What are the top potential benefits organizations are seeing from adopting a usage- or consumption-based model? What if someone told you to throw out your requirements? To start fresh? Join Brian Rohde, Senior Director of Customer Success & Implementation at goTransverse and Seth Gross, Solution Architect at CloudSense as they share their advice and lessons learned while on the front lines with customers implementing and evaluating quote-to-cash solutions. Brian and Seth will share behind the scenes interactions and honest opinions on what they wish customers knew when heading into evaluating the future of their quote-to-cash solution. In an increasingly fast-paced marketplace, businesses are under pressure to accelerate time-to-market for products and services. Companies need technologies that support agility and flexibility when it comes to getting products out the door quickly, and packaged and priced at a point that customers want to consume. Whether your IoT service is connecting cars, homes, appliances, wearable, cameras or other devices, one question hangs in the balance – how do you actually make money from this service? The ability to turn your IoT service into profit requires the ability to create a monetization strategy that is flexible, scalable and working for you in real-time. It must be a transparent, smoothly implemented strategy that all stakeholders – from customers to the board – will be able to understand and comprehend. Join Bryan Rank, Energy Management Platform Architect at Current, powered by GE and Michael Beamer, President of goTransverse as they discuss how GE’s first ever IoT application, Current by GE, built a rapid time-to-market, easily configurable and cost-effective billing system that turned energy as a service into a reality. Today, consumers are in the driver’s seat. The way they want to consume and pay is changing, forcing companies to move from selling discreet products to selling services. Is your organization set up to take advantage of this shift? In this scenario, innovation begins before the payment. To be innovative in payments, you must be innovative in pricing strategies and to be innovative in pricing, you must be innovative with your business models. 1.Tips to transform your organization from licensed-based to recurring revenue streams. 2.The value adopting usage-based billing can bring to your organization. 3.How to capture more revenue streams by giving your customers the ability to buy and pay the way they want. Michael Beamer is a 24-year technology and business leader with unique experience helping companies maximize the business impact of technology. He’s been instrumental in the growth and success of companies ranging from pre-revenue startups to Fortune 500 companies. Michael has extensive experience in a wide range of roles from Building and running global development teams to driving record revenue through global sales and marketing programs. Michael lead the effort to develop the IoT strategy and go to market model for one of the world’s top engineering solutions companies. In his current role as President of goTransverse, he is helping the company emerge as the top IoT Monetization solution provider. Welcome to the Gotransverse channel! Offering a full-stack subscription and usage-based billing platform, goTransverse addresses the challenges businesses face when they rapidly deploy new products and services with sophisticated pricing models at global scale. Learn more at www.gotransverse.com.